Bauer, A.M., Masroor, R., Titus-McQuillan, J., Heinicke, M.P., Daza, J.D., Jackman, T.R. 2013. A preliminary phylogeny of the Palearctic naked-toed geckos (Reptilia: Squamata: Gekkonidae) with taxonomic implications. Zootaxa 3599(4): 301–324. doi: 10.11646/zootaxa.3599.4.1 Reference page. Safei-Mahroo, B., Ghaffari, H. & Anderson, S.C. 2016. A new genus and species of gekkonid lizard (Squamata: Gekkota: Gekkonidae) from Hormozgan Province with a revised key to gekkonid genera of Iran. Zootaxa 4109(4): 428–444. doi: 10.11646/zootaxa.4109.4.2.Reference page. Barrio-Amorós, C.L. & Ortiz, J.C. 2016. Venezuelan geckos (Gekkonidae, Phyllodactylidae, Sphaerodactylidae) in the collection of the Universidad de Concepción in Chile, with description of the type series of Gonatodes ligiae and Gonatodes petersi (Sphaerodactylidae). Zootaxa 4136(3): 537–552. doi: 10.11646/zootaxa.4136.3.6. Reference page. 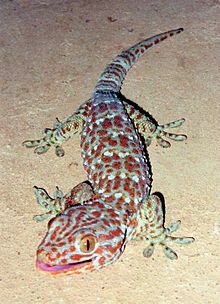 For more multimedia, look at Gekkonidae on Wikimedia Commons. This page was last edited on 19 March 2019, at 15:19.